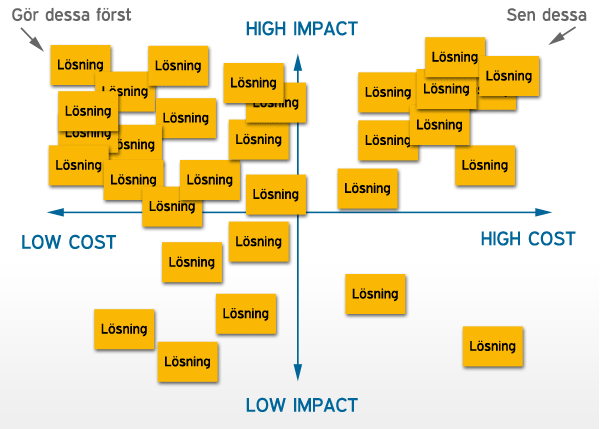 Quickly maps up what weakness or strength there is in the product or idea. Could be used as framework for quick bench mark also. Who are our target users & how can we help them? To discover real pain points as well to find what specific needs our users have, and what expectations they might have we have to meet our users. Its always best to visit them in their home or at work where they use your product. Second best is to meet them at your office. As you move away from the f2f encounter and their own space, the colder it gets. Create personas based on user research for the product, usually 3-4 per product. 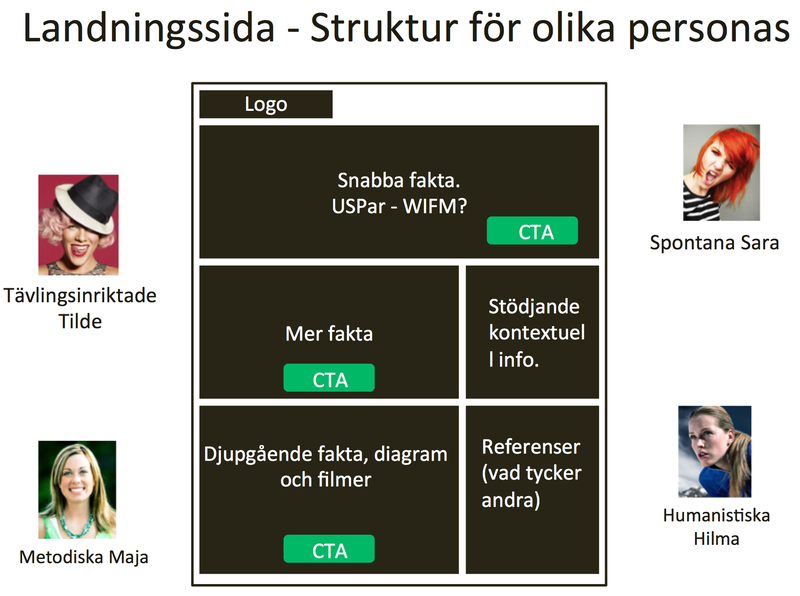 A product personas represent a target group, or a part of a target group it should be based on user needs. The personas is used through out the project or longer for a product, it makes every one involved more emotional in touch with the user. Usually we can adress all features to a persona and therefore have more knowledge in how to design it to make it useful to our users. A proto persona is a persona that is created quickly based on knowledge within the company. It is created as a collaboratively activity and can be seen as hypotheses. These hypothses can validated through out a project as a part of the iterative user centric process or with user interviews. Bryan Eisenburgs 4 psychological personas can always be used for all products. They give us 4 different perspectives on how users make decisions and what they value in the buying process. I have also added a template for where to put information in a page to adapt it for these 4 personas based on how slow or fast they are. An expert review through conversion framework to find hypothesis for improvements all over the product or on one specific page or function. The framework helps us asking the right questions and understand what could be cousin problems. 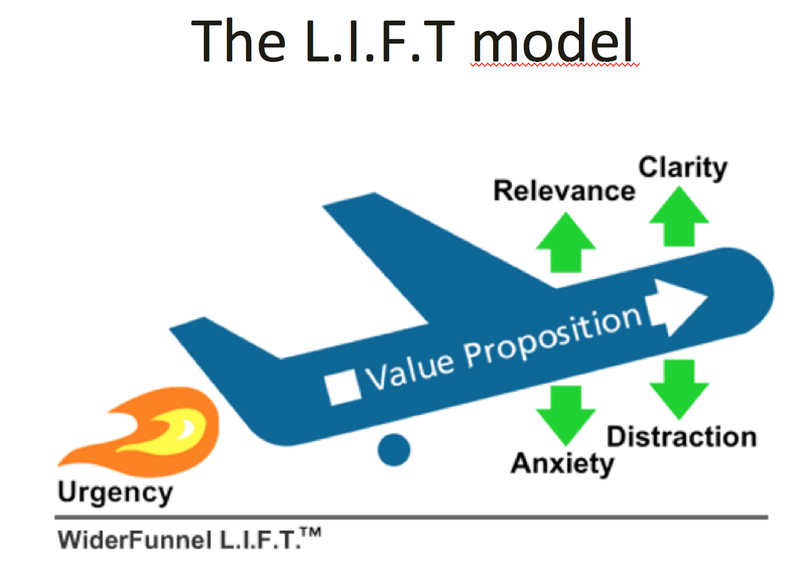 The airplane is from the conversion agency Wider Funnel. Generate ideas based on hypotheses. “We believe – If we do this – the impact would be this”. Work in small X-funk groups and generate many hypotheses, sketch on ideas for solutions – test ideas quickly on each other, or real users. Quickly sketch on solutions in X-func teams, also invite CS or other who knows your user needs. Quickly create one or several LO-FI prototypes. Just comparing what solutions other services have and what that might do for their users or business. 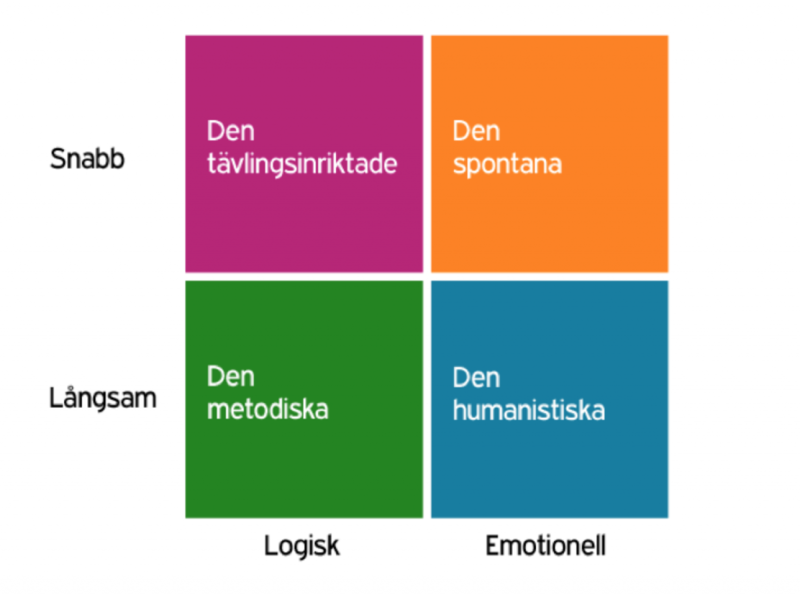 Doing this as an activity in x-functional teams gives you shared knowledge – it´s fun! Might give ideas on what user expectations are be for your service. Possibilities to steal with pride or not make the same mistake perhaps? Create Minimum Testable LO-FI Prototype. Test user behaviour and flow – get feedback quickly to o create prototypes to test on real users is a great way to minimise risk. There are several ways of quickly test if the product idea is interesting. Using Ad Words is a great way to see what users search for and act on gives instant input. Test your hypotheises for changes that can give you learnings on what works or not. Set a clear goal, analyse and test. A/B test one or several ideas. Multi Various Testing is for lots of different options where the software automatically set together the different alternatives, this is a bit mor tricky, since it is more difficult to get good learnings from the test. Split URL test for advanced changes on dynamic content. Tool: Visual Website Optimizer is a useful and often used tool for professionals with a great wysiwyg tool. 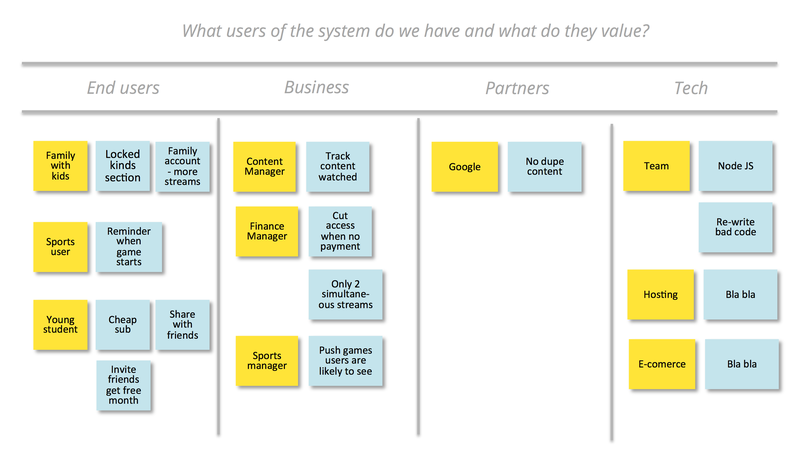 Prioritisation of features and content in service based on user expectation and motivation. Everything moves down in time from exciters to must haves. 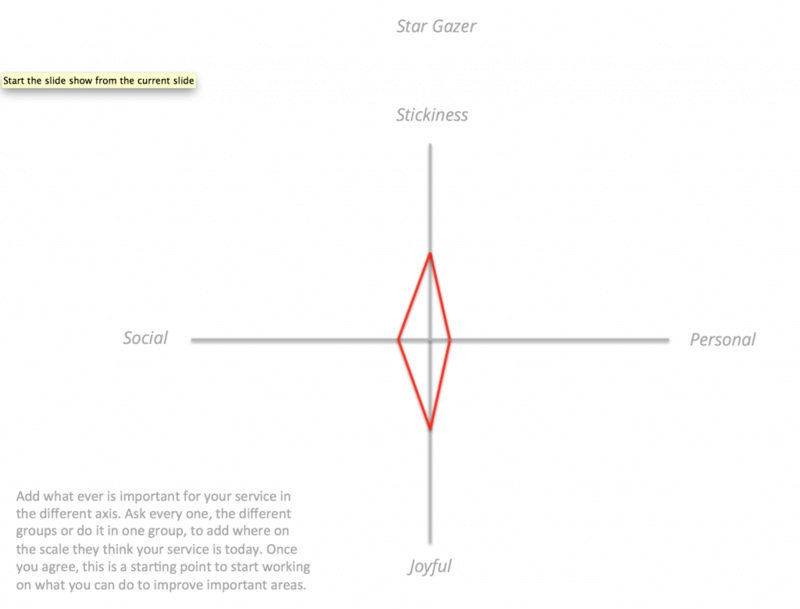 The kano model is divided in 3 levels: must have, should have and eexcites delighter’s. 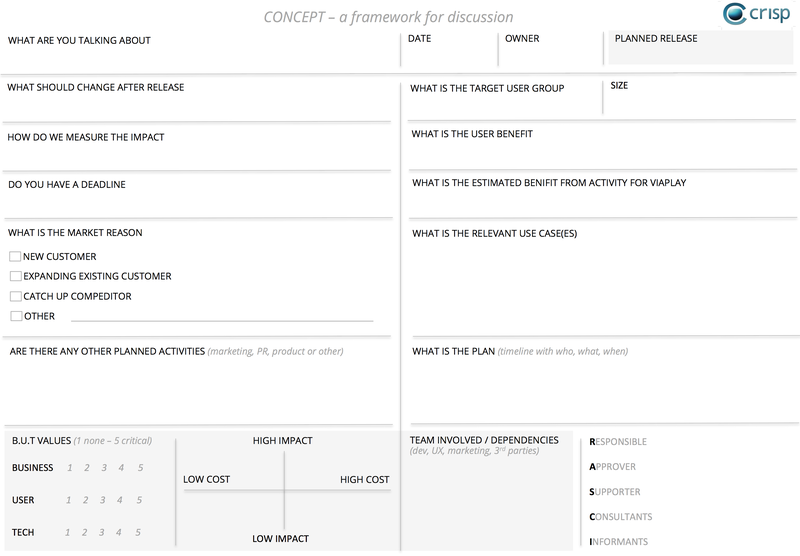 Build the story of the product/feature from scenarios together in X-func teams to minimise handover and plan the project with deep discussions on solutions just from use stories. Cluster user stories from different scenarios in activities, slice in tasks and prioritise within activities. Used in large or small projects to align team and prioritise. Keep in mind there are several ways of testing your idea and deliver value in the shape of feedback – or user / business value. This sounds a bit stupid perhaps, but it´s really great! I implemented this on Viaplay in all Jira tickets, as well as in the Concept we started using. What you do is that you push every one to always specifying value on everything that goes in the backlog. It hells team and PO prioritise more transparently. Business value value 1-5, User value 1-5 and Tech value 1-5. 5 being critical – and 1 not important. Makes it easy to prioritise all items equally since all aspects are equally important. Quickly and easily map ideas based on high/low impact/cost on your teams kanban board or right at the workshop. Discuss and evaluate together to learn from each other and improve as a team. This is a game to play for prioritating from different perspectives. Either play it with real end users and different stake holders, or play the role of them. All players get a pot of money, the pot should be less than the cost of one features. The idea is to get players to discuss and try to convince each other in the group. One group could perhaps be business stake holders and another group real users from a prioritised user group. It helps team and PO prioritise on value. This is a simple but effective tool where you give points to features from different perspectives to see what feature gets the most points. Good to use with stake holders to get a common view on prioritisation. 5.4 should of course be Minimum Viable Product 🙂 Lots of stuff for me to dig in to. Thanks! Please let me recommend the user story mapping method for product discovery process. Thanks for it’s visuality non-technical members can be invited for the ideation process. It works at the office’s wall and also with any online story mapping tools.